NOTES: Short run with photo etched and resin parts. The Type 135 civil twin design was on Bristol drawing boards by July 1933. In 1934, this design was offered to Lord Rothermere, owner of the Daily Mail who had wished to promote British aviation. He had asked the industry to deliver the fastest civilian aircraft in Europe, capable of carrying six passengers and two crew members. Bristol further refined their original design to produce the Type 142. When it first flew as Britain First at Filton on 12 April 1935, it proved to be faster than any fighter in service with the Royal Air Force at the time. Needless to say the Air Ministry was interested in such a plane for their own uses, and quickly sent out Specification B.28/35 for prototypes of a bomber version of Bristol called the Type 142M (M for "military"). The main changes were to move the wing higher on the fuselage from its former low position, to allow room under the spar for a bomb-bay. The aircraft was all-metal with twin Bristol Mercury VIII radial engines of 860 hp (640 kW) each. It carried a crew of three – pilot, navigator/bombardier and gunner/wireless operator – and was armed with a forward firing 0.303 inch (7.7 mm) machine-gun outboard of the port engine and a 0.303 inch machine-gun in a semi-retracting dorsal turret firing to the rear. A 1,000-lb (454-kg) bombload was carried in the internal bay. To achieve its relatively high speed, the Blenheim had a very small fuselage. Pilot's quarters on the left side of the nose were so cramped that the control yoke obscured all flight instruments while engine instruments eliminated the forward view on landings. Most secondary instruments were arranged along the left side of the cockpit with essential items like propeller pitch control actually placed behind the pilot where they had to be operated by feel alone. Like most contemporary British aircraft, the bomb bay doors were kept closed with bungees and opened under the weight of the released bombs. Because there was no way to predict how long it would take for the bombs to force the doors open, bombing accuracy was rather mediocre. The concept of a fast bomber was realized definitively with the de Havilland Mosquito. The last bomber variant and the subject of this kit, was conceived as ground attack aircraft using a solid nose containing four more Browning machine guns. 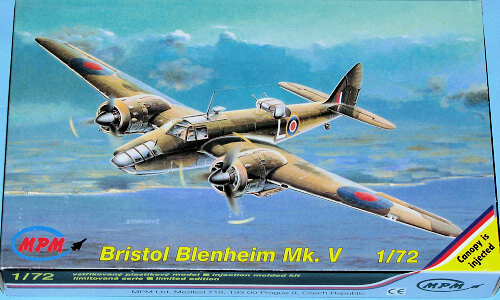 Originally known as the Bisley, the production aircraft were renamed Blenheim V and featured a strengthened structure, pilot armour, interchangeable nose gun pack or bombardier position and, yet another new Mercury with 950 hp (710 kW). The Mk V, or Type 160, was used primarily in the Far East. This is one of the alternate boxings of MPM's Blenhim bomber. This one provides the bits to make the last of the series, the Mk V. Typical of MPM, the parts are finely engraved and have no alignment pins. Some of the smaller bits are on one of those round sprues that I've not seen in a decade and all of these particular bits suffer from mold mis-alignment. Not a good thing as these are the landing gear legs, fuel dump tubes and a number of smaller strut sections. I suggest replacing as many of these as possible with plastic rod, it will be well worth the effort. Sprue attachment points on these parts is also quite large and with some bits right up against the sprue, much care will need to be taken to prevent breakage. This is not true of the rest of the sprues as they are in fine shape and have reasonably small attachment points. A special sprue just for this variant is cast in an off-white plastic and basically provides a new nose, interior floor, gear doors, tubular exhaust and a new turret section. A nice touch is injected plastic clear bits. Photo etch is used for some small interior bits like instrument panel and belts while resin is suppplied for engines, guns prop hubs (gawd, why can't these guys mold the props and hubs in one piece), 'hedgehog' exhaust, and a few other bits and pieces. Instructions are pretty straight-forward and include twelve nicely done construction steps. There are smaller insets showing placement or alignment of some components where there might be a question. Color information is provided along the way in generic and Humbrol references. Four markings options are provided. One is the box art aircraft in desert camo from an unknown unit. In a similar scheme is the 18 squadron aircraft of Victoria Cross recipient H.G. Malcolm based in Tunisia in December of 1942. Another desert aircraft is provided in Free French markings while based in Syria. Finally, a coastal command scheme for 13 sq, Greek AF while in Aden during 1943. I can imagine this latter plane saw no action at all while based at this rather forlorn outpost. So there you have it. No collection of Blenheims is complete without a Bisley/Mk V in the mix and here you have one. It won't be a real simple build, but should be one that will provide construction enjoyment and give you an interesting model when done.